Blue Dragon is a Boss in Demon Souls. The first time you encounter the Blue Dragon is in the dragon's roost in 1-1, here it merely serves as an environmental hazard and it can not be killed. 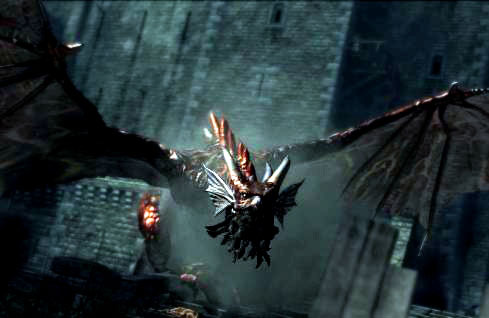 It will on the other hand leave its post, and fly towards the King's tower, when its health gets down to about 10%. The first time he appears on a long walkway blocked by two Fat Officials. The first Official will usually be roasted, but the second needs to be lured into roasting range with an arrow or two. Note that you can remain safe on the left side of the walkway for a fair distance, but the doorway makes an easier point for arrow fire if you have the range. Now you can do some damage to the dragon here, which makes it easier to save Biorr at the next encounter. Attack the dragon with arrows or magic. Aim for his wing as it's closer and the closer something is to you, the more damage your arrows will do. He'll fly up to his second site when his health reaches 50%. Alternatively, just run past and spook it to fly to it's second perch. To run past, wait on the walkway about one crenelation past the larger crenelation appearing after the two barrels. As the dragon begins to direct it's breath away from you, start your sprint. You can run through fire zone with no damage. When you go up to the next level the Dragon will fly off to his second perch above the staircase. Note that if you stay on the bottom stair after making it past the Officials you can lock on easily. Either with soul ray or arrows, fire when his head is falling from the raised position of the animation and it will line up to hit in his mouth dealing the most damage. Using Kunai purchased from the vendor at the beginning of 4-2 it is possible to poison the dragon from outside fire-breathing range. This can be used on its own as a way to kill the dragon (slowly) or as extra damage while you are firing arrows/spells. This works for both parts of the 1-4 encounter. If Biorr is alive he'll try to help you here. He really just gets roasted about 100 times, taking 13 damage each time. You'll likely get hit trying to get up these stairs at least once on the first several tries. With that in mind, try using some appropriate spells or miracles. Second Chance is great if you have it, since it lets you immediately resume running. Otherwise, Water Veil and the Ring of Flame Resistance are recommended. Keep some Full Moon Grass selected if he doesn't kill you in one hit, which he shouldn't with these precautions. It will first spray from your left to right, then from right to left. If your equipped weight is less than half your max, try sprinting on the right side once it sprays from your right to left. You should be able to make it unscathed. Please note however, that once Biorr is dead, the blue dragon will actually be able to spray directly underneath itself. Even if you can't see it, you can still R3 lock on to it and shoot arrows. You will be able to hear a hit. There is a safe spot halfway up the staircase, on a small landing. Sometimes Biorr will be standing in this spot, running back and forth firing his crossbow at the dragon. You can stand here and fire arrows at the dragon's head without being hit by his fire breath, just lock on with R3 and fire away. Either stand here and attack or use this as a safe zone to time the breaths and finish running up to the doorway below the dragon. Once you manage to get up to the top landing there's a set of statues just before the door it's guarding. If you hide between the first statue on the left and the dragon, the flame breath can't touch you, even if/when Biorr dies on the stairs. You can still lock onto it from here, but hitting it is slightly harder as you're aiming at the mouth which is a moving target. Once past the fire, you'll be directly beneath him. Try killing him with ranged attacks. He isn't resistant to fire. For instance, try using Fire Spray and Fresh Spice to take him down (with Insanity Catalyst and Ring of Magical Sharpness). If you don't have these, hit him with some more poison or plague and let him fall apart that way. Biorr can survive for a long while, and he won't help you any more after this encounter so don't worry too much about him. Just add on some damage. As a reward, you get safe access to some Legendary Hero Souls from the dead corpses on the stairs. It's also possible to stand just inside the doorway and lock on to the dragon's head, which can be seen moving back and forth above. Just keep locked on, and keep pumping arrows into it. For maximum efficiency, watch its movements: When it does a slightly wider look to the right, it'll dodge one arrow, so start firing just as the head looks back left. With the Lava Bow and 25 DEX, you can pump five arrows into it before taking a quick pause, and repeat until it's dead. In either encounter if you want to save on arrows and spices, this is a good time to use any Throwing Knives you may have aquired. The damage will be minimal and as such it will take longer to kill him, but it could save you on resources. Using Kunai to poison him is also very effective. usually takes between 15-25 kunai. In order to reduce the tedium of this fight, it's a good idea to maximise the attack power of your available ammo. Use Magic Sword "Makoto" to reduce your HP to less than 30% (or creep out to the edge of the dragon breath and take a hit). Equip a Bow with a Morion Blade in the other hand. If you can make it inside the building at the top of the stairs, stand just inside the entrance and look up, you can see the dragons head and throat. Target (not sniper mode) and shoot arrows using damage strategies above. Sometimes Biorr will find the safe place to snipe and actually help you. Obviously, if you're using magic then mana regen equipment, is a must. The Fragrant Ring takes longer but saves on souls for fresh or old spice. Equip Clever Rat's Ring and the Ring Of Magical Sharpness. Equip Morion Blade in one hand and a catalyst in the other. Use a cursed weapon to drain your HP below 30%. Go to the entrance of the building just past the area where the dragon is breathing fire now lock on him and start casting Soul Ray or Soul Arrow. Keep doing it until he dies. Make sure to bring enough spice or a crescent weapon to refill your MP. It is commonly believed that you can equip the Ring of the Accursed and stand just outside the dragon's fire range, thus letting Biorr kill the dragon if you can get him into a safe spot. If Biorr does 1-3 points of damage every 6 seconds, 6102 health should be gone in about 5 hours. Experimenting shows that after this time period the dragon's health bar is not reduced at all, despite Biorr still being alive and supposedly having done enough damage to kill it. Either the damage number is fake, or the dragon regenerates. You can get Kunai from Graverobber Blige in the Shrine of Storms. Make sure you get a good number, as they normally do pitiful physical damage (about 4 points), but have a chance for applying Poison damage over time. On the Dragon they seem to eventually do 1000 damage. Ignore him on the first encounter and continue to his second perch. Stop in the doorway beneath him. You should be able to look up and lock onto his head. Then simply stand here and toss Kunai. When the poison takes effect (damage will start slowly counting), stop throwing Kunai (damage inflicted by Poison does not stack). Once the Poison effect wears off, repeat the process. It should take about 50 or so Kunai to kill him. Biorr will most certainly die if you take this very time consuming route, so be aware of that. The Clever Rat's Ring and/or Morion Blade makes this fight faster. Just be sure you take some damage (HP < 30%) before arriving at the first encounter. Both Holy and White Arrows are too rare and expensive to be of practical use against the Blue Dragon. You may choose to bring the dragons life to 50% before moving on to the second encounter. You will, of course, lose the time/ammo expended if you die in the second encounter. Use Sticky Compound Long Bow +5 / White Bow for the second half of the battle. Any other bow will do pathetic damage to the dragon from that distance. Bring enough (500+) non-magical arrows. Light/Heavy will do the most damage to this boss. Use heavy arrows for the first part and light arrows for the second half of the battle. Using any other arrows (other than Light arrow) without Clever Rat's Ring set up does damage of < 10 per arrow for the second half of the battle. For the first half of the battle using Heavy Arrows with Lava Bow (Dex ~30), damage per arrow was around 50 per arrow without Clever Rat's Ring and Morion Blade. With Sticky Compound Long Bow +5 (Dex ~40 and NG+) damage was around 60 per arrow. Biorr is basically worthless here, so don't pretend that you want him alive. In fact if you need to kill him for the Mephistopheles quest, then do it before now. As with the Red Dragon and other bosses, once he is killed, he is gone from this playthrough until the next game. Subsequently when you go through 1-4, you will fight the two Fat Officials but without the bother of a huge fire breathing dragon in your face. If you simply run past the Blue Dragon and go on to kill the 1-4 boss, both it and Biorr won't appear again in that playthrough (Biorr will also disappear from the Nexus).